Isn’t this pretty? 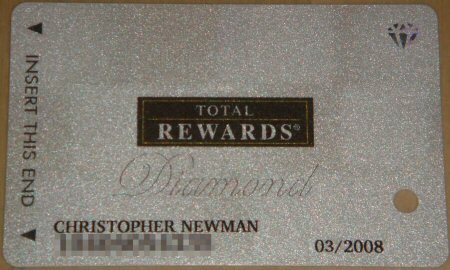 Say hello to my Diamond Total Rewards card! It’s not the very top tier of the Harrah’s players club, but it should still be enough to fool them into treating me like a high roller! This card acts as a priority pass to just about everything. Staying at the hotel? No need to wait in line to check in. Don’t want to wait for a buffet, or for the casino cashier, or for the players club? Even for a damn taxi. Just flash the plastic and step right past the plebs to the front of the line. Valet parking full? No sir, not if you’re Diamond. There’s also the Diamond Lounges - one in every property – where you can go and chill out with free food and a bar. If you’re worthy. Then there’s the wealth of offers that I should now start to get by mail. Room discounts (possibly even free stays), free show tickets (two every month guaranteed) and even cheques for real money just to get me back into the casino. Best of all, because I earned this status on January 1st, it’s valid right through until March of 2009. Although the card pictured says 03/08, apparently they don’t have the new batch yet and they’ll be sent out in the mail in February. So what does this little life upgrade cost? Much less than you would expect if you do it right. To earn Diamond status you usually have to earn 10,000 reward credits in a year, but if you clock up 3,000 in a day and ask nicely, you’ll get upgraded instantly if it’s your first time. To earn a reward credit you have to feed in and spin through $5 on a slot machine, or $10 on video poker. Clearly, doing it in a day is much better than gambling $50k or $100k over the course of a year, but pumping fifteen grand through a slot machine in one sitting wasn’t an attractive proposition. But with the horrible paytables at the Harrah’s casinos in Las Vegas, neither was $30k on video poker. So we drove to Harrah’s Laughlin, where there’s several 99.5% payback video poker games, including a 50-line multi-play effort. 50 lines x 5 coins per hand x 5c per coin is $12.50 per spin, but because you’re drawing each hand fifty times you always get at least some money back – in theory it’s a low-variance way to churn through the play requirement quickly. With two of us playing on the same account, we got there in about four hours. This really is one of the most peculiar advantage plays I’ve tried. I never thought it would be possible to get good value out of Harrah’s, but so far the signs are very good. In fact I ran below expectation (just two royal flushes between us in 120,000 hands – I’m owed again!) and it cost me about $600, so I might need to see Jubilee! twice or three times to get full value.